TinyMinerPlus v5.77 has just been released! Your EVE Mining Bot of choice, fully compatible with EVE Online, April 2019 update! Get your own ISK Printing Machine right NOW! 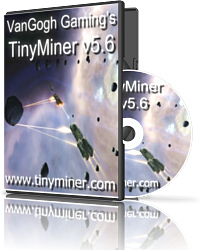 TinyMiner is an all-around "EVE Online Mining Bot Macro Miner" application designed for the popular MMORPG "EVE Online". If you're reading this then you're probably already familiar with the game to a certain extent and you already know how tedious is the job of mining asteroids. This is where TinyMiner comes in and takes over by fully automating the mining process for you so that you can enjoy the game without having to grind for ISK. Lately TinyMiner has been expanded to include new modules such as a Market Trader, Items Seller and Assets Hauler, becoming the true king of AFK profits! TinyMiner rolls in billions of ISK for you while you're at work, at school, sleeping, eating, watching TV, shopping, out with your friends or simply away from your computer. What makes TinyMiner different from all the other EVE Online bots out there? Simply put, it is an EVE Mining Bot Macro Miner that has been designed right from the start to maximize your mining yield (after all, ISK is what you're after!) and it is packed with efficient features to accomplish just that without falsely advertising fancy bells and whistles that more often than not fail to work like other poorly made EVE Online bots out there. TinyMiner is a professionally programmed and fully tested EVE mining bot (No bugs, No errors). It is guaranteed it'll work out-of-the-box, unlike other EVE macro miners out there that are full of bugs and use their customers as beta-testers for the mining bot they had already paid for! Get TinyMiner and thwart Darth Vader's plans of conquering New Eden! With TinyMiner you can make billions of ISK (double that with TinyMinerPlus) with a good ship mining safely in high security space. All ships are supported, from the lowly Venture to the mighty Rorqual! Deploying mining drones and activating command burst modules can boost your yield even further! Should you choose to mine in mid security space, TinyMiner can defend your ship against NPC pirates with combat drones and active modules of your choice (shield boosters, armor repairers, active hardeners, etc) so you can rake in even more ISK! That combined with a generous try-before-you-buy offer it just doesn't get any better than this. If you want a robust, super-fast, "no-nonsense" EVE Bot that gets the job done flawlessly then TinyMiner is the EVE Online mining bot for you! This EVE macro miner is a veritable, relentless ISK-making machine! For over 10 Years now, you've seen mining ships stripping away belt after belt in EVE Online and you've never known that the TinyMiner EVE Mining Bot was piloting them silently, never to be detected! It's time you join the party and watch the ISK rolling in! Buy with utmost confidence, our 100% positive eBay feedback and over a decade of experience in online sales stand as a True Testimony to our Excellence! TinyMiner will mine like a champ as most of our pilots are fond of saying! NEW: Added support for the "Rorqual and Orca" industrial command ships for the ultimate profit, deploying "Mining Drones" for an even greater yield, "Warp directly to the asteroids from bookmarks at 200km away in each belt" for supreme efficiency, "Monitor local chat for Hostiles" and "Monitor the Directional Scanner in Wormholes" for the ultimate peace of mind, a "Jettison Can" option for those boring fleet operations, a "Jettison at a Safe Spot" option to avoid those pesky can flippers and a "Gate Mining" option for those juicy systems full of asteroid belts but no station. You can now mine them and unload the cargo in a nearby system one or even two jumps away and at the same time stay safe from suicide gankers. This exclusive EVE Mining Bot option is only available for TinyMinerPlus users! The "Local Chat Logs Monitor" and "Private Messages Monitor" options are of great help in protecting against human detection by searching for the specified keywords and even responding with random saved messages to convince anyone that you are just chilling, enjoying a quiet and relaxing mining session! Furthermore TinyMiner can notify you by email whenever something unexpected happens in your mining session so you are always on top of things, just have your smart phone ready to receive emails! That way you can immediately log in remotely from your smart phone, laptop, tablet, work computer, etc, using Logmein, TeamViewer or similar apps and respond to the chat yourself thus confirming that you are a real person mining peacefully and not an Eve Online Mining Bot! Among the newest features you can also find the "Check for 100% Full Ore Hold", "Repair Ship in Station", "Check for Belt Rats", "Find Ore Sites and Ice Belts" and "Daily Auto Restart" options, adding another layer of versatility to an already perfect EVE mining bot! On top of all that add the "Mission Mining" option to operate the acceleration gates in agent missions for the stealthiest pilots wishing to keep a low profile while they are mining themselves a fortune! The latest "Rorqual/Orca Drones Mining Mode" takes advantage of the hefty bonuses bestowed upon industrial command ships by the "Ascension" expansion for Eve Online. As such the Rorqual (for null-sec miners) and Orca/Porpoise (for high-sec carebears) have become superb choices for AFK mining in style without leaving a trace and they rack up tons of ISK without worrying about starting and stopping lasers and other time-wasting micro-management! The newest TinyTrader EVE Online Market Bot, Standalone Add-on includes the Market Trading, Items Seller and Assets Hauler modules. The Market Trading module takes care of updating your buy and sell orders so that they are always on top (this works simultaneously for as many Eve Online clients as you want if you have a character ready to trade in every major trading hub). The Items Seller module will automatically set up sell orders for the specified items in your hangar. Last but not least the Assets Hauler module will take care of picking up your items from as many waypoints as you specify and bring them all in one central hub (Jita for example). No bookmarks are required! Exclusive Bonus: The TinyMiner "EVE Online Guides Bonus Pack"
10 (ten) EVE Online Comprehensive Player's Guides spanning all aspects of the game (training skills, fitting ships, using drones, agent missions, ecm & eccm, market & trading, carriers faq, POS guide and much, much more! 7 (seven) EVE Online ISK Making Guides, leaving no stones unturned when it comes to fattening your ISK wallet! Discover insider secrets for manipulating the EVE market in order to sweep billions of ISK! 4 (four) EVE Online PVP Guides, learn how to effectively blow up other players' ships into spacedust! Ever wanted to become a pirate? Aargh, look no further! 4 (four) comprehensive EVE Online Wormhole Guides, the elusive sleepers and their riches will reveal all their secrets! Life in a wormhole can be very profitable indeed! A Complete Miner's Guide, this one really crunches down the numbers on everything you would possibly need to know about mining anything, with any ship, anywhere in EVE Online! A Complete PI (Planetary Interaction) Guide, totally autopilot profits don't get any better than this! This also includes full PI Material Diagrams. COSMOS Missions 101, a detailed walkthrough on how to complete these unique type of missions and getting billions of ISK worth of faction items and blueprints! In-Depth 2D Maps of the EVE Universe, perfect for finding that sweet secluded mining spot where you can mine yourself a fortune! *Please note: Although you can successfully use ANY ship with the TinyMiner EVE Online Mining Bot and make a good amount of ISK even from your first hour of playing Eve Online with a new character by using the specialized "Venture" mining frigate, in order to achieve billions of ISK in a reasonable time frame you need to have a moderately skilled character capable of flying at least a "Retriever" mining barge, preferably a "Mackinaw" exhumer with the accompanying mining skills, implants, drones, tech 2 modules and fleet booster support. *Disclaimer: VanGogh Gaming is the developer, copyright owner and the only authorized seller of the TinyMiner software. Eve Online is a registered trademark of CCP. VanGogh Gaming and the TinyMiner website are NOT affiliated with CCP in any way!